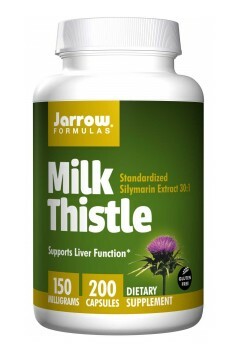 Useful during and after steroid "cycle"
Jarrow Formulas Milk Thistle is a dietary supplement which contains 150 mg of milk thistle extract (Silybum marianum) in a single capsule. Up to 80% of the composition are flavonoids and their main representative in the preparation are complexes of silymarin, which show a very wide range of pro-health properties. It is used mainly to support numerous liver functions. Silymarin is a complex plant compound used in medicine. It consists of flavonolignans (silybin, isosylibin, silycristin, silydianin, taxofilin). The available sources indicate that silymarin has a very wide range of use: it has antioxidant, anti-inflammatory, detoxifying, anti-proliferative and antispasmodic properties, protects the liver from toxins and stabilizes the cell membranes structure. Silybin is the main component of silymarin. It is believed that it has anti-hepatoxic properties and acts against numerous chemical substances which could interfere with the functioning of the liver cells or damage them (mycotoxins, carbon tetrachloride, ether, paracetamol, pyramidon, antipirin, ethanol and chloroform). Moreover, it can act anti-inflammatory and antioxidant. Furthermore, the clinical studies suggest that milk thistle has a beneficial effects in supporting the treatment of both acute and chronic liver diseases, prevention of cirrhosis of the liver and gall stones. Such an action may probably increase the protein synthesis in hepatocytes, which results in their better regeneration. The advantage of use of these preparations is also the lack of significant side effects arising from the use of high doses over a longer period of time, compared to drugs. The studies suggest that the use of milk thistle together with traditional treatment may improve the effects of therapy. A decrease of glucose levels in bloodstream and the improvement of the cholesterol management have been demonstrated in people with type II diabetes. However, a decrease in LDL cholesterol and related to it benefits among healthy people are not so obvious, because the studies were performed on diabetics and they often have increased cholesterol level. The researchers also discovered that the use of Silybum marianum may improve insulin sensitivity, which is a key feature for this disease. It is a skin disease, characterized by the overproduction of sebum and chronic inflammations of hair-sebum roots. It is believed that free radicals cause damage to lipids in the skin, and it results in inflammation. The most recent studies have shown that people suffering from acne are not able to alleviate the damage because their endogenous protective system against free radicals is not working properly. That is why the supplementation with antioxidants, including milk thistle, may be very effective. In the studies, in the group which was using a supplementation with silymarin the total number of above discussed damaged was significantly reduced. It should be also noted that the effect was obtained after at least two months of oral supplementation with 210 mg of silymarin. To sum it all up, Jarrow Formulas Milk Thistle is a dietary supplement recommended for people who suffer from liver diseases and its invalid function. It can be used as an agent which supports treatment and liver regeneration. The supplement may be also used as a preventive agent in relation to the above mentioned problems, among both healthy people and those who are vulnerable to such problems. It is perfect for people who are vulnerable to liver damage which are caused by hepatoxic drugs and substances (supplements, medicines, illegal doping agents, toxins). Also people suffering from acne may try this supplement. Milk Thistle 150mg 200 caps. This product contains silymarin - a substance with hepatoprotective properties. It protects the cells of the gastric mucosa. It also has the ability to increase gastric acid secretion and has a cholagogic, so it can be used both for protection and to minimize the digestive disorders. 150 mg dose contained in 1 capsule taken once a day is enough for minor illnesses, but in more serious cases you should take higher dose - 150 mg three times a day. The treatment can last from 3 weeks to 3 months.